Kitties can show love, too. If you think that your precious kitty doesn't show you a lot of affection or respect, consider the possibility that you just don't understand her "feline speak." Through body language, cats can convey complex and loving feelings to their favorite and most trusted human beings -- aww. If you spot your little one staring at you, pay close attention to her eyes. If her pretty peepers are slowly but surely blinking at you, then she is basically telling you how much she loves you. A huge compliment, indeed. When you come home from a long and grueling day at the office and your cat meets you at the door with her tail pointing high into the air, slightly shaking, then you're in the presence of a fantastically excited cat. She adores you and is giddy about seeing you -- and her body language is certainly expressing those feelings. 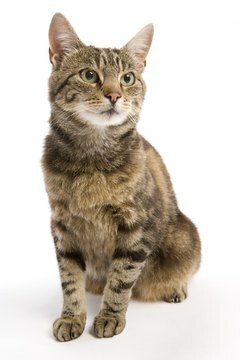 When a feline's ears are positioned forward, it indicates that not only is she feeling pretty content, she's also totally engaged and focused. If your pet is doing this around you, take it as a sign that she respects you and is paying close attention to your every action. Never fear, this is not just a case of an aloof kitty trying to convince you to give her some more yummy tuna treats. Ah, purring. For a cat lover, a genuine purr often seems like a genuine compliment -- and it is! If you're petting your fluff ball's head and she lets out a low, rumbling purr, then it means that she is truly enjoying herself. She loves being around you and is reveling in the interaction. One of the most endearing ways in which a cat may express affection, respect and trust is by showing you her belly. When a cat rolls around on her back and allows you to see her belly, she is essentially telling you that she trusts you with her life. After all, cats are at their least protected body-wise when their stomachs are showing. When a cat is kneading in your presence, it usually is a sign of pure joy and happiness. The paw-pushing action emulates comforting nursing behaviors -- a holdover from when your pet was a wee kitten with her mama. If your fluff ball trusts and respects you enough to do this around you, then you surely should feel deeply honored.